Animal Abuse Allegations at epidemic levels. Those targeted say it's malicious prosecution... and it's about the money... lots of money. June 30, 2015 - Jason Markley says he is falsely accused. He says every stitch of the so-called "evidence" used in his prosecution for animal abuse was manufactured. He says he can prove it but the judicial system has turned a blind eye and deaf ear to the evidence he uncovered. Jan. 3, 2016 - Markley is right. He was clearly set up along with at least 21 other people who fell prey to King County’s malicious prosecutions. Markley says the King County Prosecutor'a Office concealed a 45-incident career criminal history of one of their primary witnesses - one of their own employees. This included 2 felony arrests - one for VUCSA (drugs) in 2008 and another earlier for shoplifting in 2006. This is a money-making criminal business model alive and well in the entire state. King and Pierce County are leading the pack with Snohomish County bringing up the rear. Westberg was listed as the primary suspect in a serial vandalism case in the City of Auburn in the fall of 2013. Jenee must have gotten mixed up because it wasn’t her sister who purchased a house in April of 2013. It was Jenee who purchased a home in April of 2013 and that was about 5 miles away from the victim - not "across the street." Jenee’s sister does not own the property across the street. Jenee just admitted to stalking the vandalism victim at least 10 times with the King County internal investigator. (BTW – Most of her victims claim the exact same serial vandalism playbook – sorry again Jenee). Instead of investigating it, King County was busy finishing up Westberg’s third Loudermill while beginning the fourth Loudermill hearing and investigation – none of which the King County Prosecutor’s Office disclosed to any of the phony prosecution cases including the active ones at the time – (sorry Gretchen). But wait. It gets better… Guess who the City of Auburn vandalism “victim” was? When the Auburn Police Detective Wickman investigated the complaint, instead of calling Jenee’s supervisor, he called Jenee directly after he determined she still worked there. From his report, it is pretty clear he gave her what is known as “professional courtesy.” Then he tabled the investigation after talking with her. That was not the case on Jenee’s side. She kicked it into overdrive. (A claim Wickman would later adamantly deny at least four times in one conversation with the investigator following up with him). Jenee went on to claim she feared for her life and that she was going to have King County Deputy Prosecutor Nancy Balin and Jenee’s mother use their influences (Jenee’s mother worked in IT court records for KCDPA Chief Dan Clark) help her get a restraining order (with no grounds). There was one problem. Markley had not threatened her. He had not stalked her. He had simply reported one of at least 10 vandalisms on his property since Westberg showed up and held him and his family hostage for 4 hours alleging he abused one of his two horses – the very old elderly one that changed into two other different colored "after"horses once Westberg got her hands on him in the dark and then "rescues" invoiced for at least seven times. (This is documented by public records). One of those seven times invoiced were for was by KCDPA Gretchen Holmgren in a complately different case - the Dunham case calculating Dunham's restititution for Markley's horse that doesn't belong to Dunham). Oh and Jenee demanded that the county provide her with a bullet proof vest. Now Nancy Balin is a government attorney and is barred by state statute to represent anyone privately at any time for any reason unless they are a relative. But RASKC director Gene Mueller gave permission (after Nancy already had serviced Jenee’s needs) – which he may not know he doesn’t have the authority to do – but Nancy certainly does know (especially since someone filed a bar complaint against her for the very same thing a year earlier) and she did it anyway. To complicate matters more, Nancy is the King County government attorney who represents RASKC as a King County agency. If Jenee was guilty (which it looks like she is given her admission), Nancy’s duplicity would put King County is a world of tort claims (and it has). All in all, this is one great big cluster of legally-defined conflicts of interest that will probably take years to unravel. Be that as it may, the King County employees tasked with handling this kind of thing at the time immediately implemented their employee safety-protection protocol. They offered Jenee victim counseling. They offered her a desk job instead of driving the animal control truck. The investigator and the counselor got a bit suspicious and reached out to City of Auburn’s Det. Wickman. Everything came to a screeching halt when APD Det. 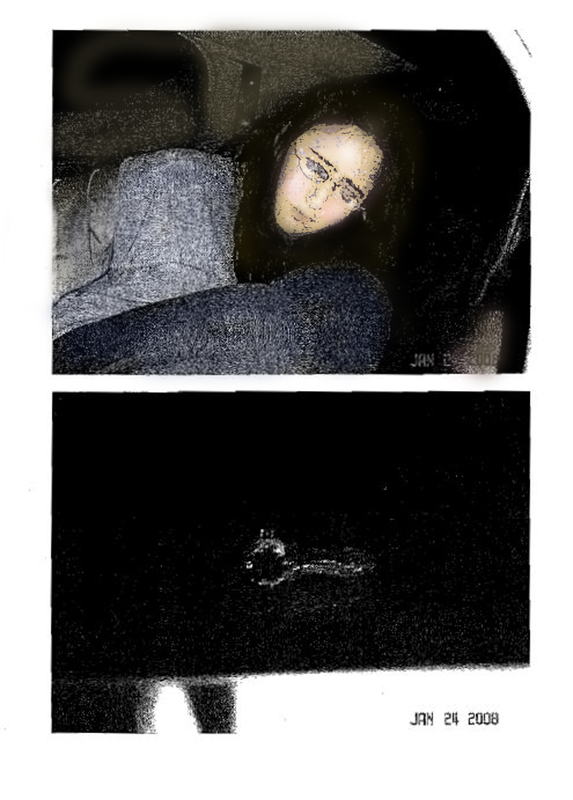 Wickman fell all over himself denying he ever told Jenee that Markley was dangerous. In fact, he told the investigator, he adamantly informed Jenee he didn’t think Markley was dangerous at all. Needless to say, Jenee didn’t get a restraining order. And this was the beginning of overlapping Loudermill internal investigations that would ultimately get Jenee fired a year later (late 2014) after King County found she lied about her whereabouts on many occasions, falsified her animal control investigations in several animal control complaints on Vashon Island and one with a boyfriend who mysteriously died last summer. Jenee’s fabrications were confirmed through the GPS in Jenee’s animal control computer. One might think… that with all that King County knew (and knows now), they just might consider reviewing the rest of the criminal prosecution cases that Jenee was tasked with as an “expert witness” and start looking at vacating those cases. It’s not like no one confronted King County with it. King County has had to dismiss two active cases over exposure of Jenee’s background – a background that was never disclosed to the falsely accused defendants by King County but instead by other wrongfully accused defendants. AND King County still has five missing horses to return from a dismissed case that is now going on five months old. King County doesn't seem to know where the horses are... While Hannah Mueller continues to bill King County for them. Why isn't King County doing the right thing? It’s called “loss mitigation” AND protecting those who should be held accountable. What do you do when the real criminals are in charge of the judicial system? King County and the King County Prosecutor’s Office would rather let innocent people be cannibalized by one of their own drug addicted criminal career employees (and her “friends”) than to attempt to take in on the chin and make it right for these wrongfully accused honest community taxpayers they made into criminals with phony prosecutions. And as one can see below, there are a boat full of folks who are going to take it on the chin. Prosecutors, defense counsels, judges… wait did we mention the Washington State Bar Association Office of Disciplinary Counsel? There are rumors that this board has been, for some time, operating a guardian trustee scam within the bar to cannibalize innocent people all over the state who are being set up to lose their distressed properties to ODC principals. King County Washington animal abuse scam, racketeering, and the movie "ZOO." More to come… January 3, 2016. One of the more spectacular is the Dr. John Dillar case where the county and DEA illegally seized over a $1.5 million of Dr. Dillar's property (and his 39 horses) and still have not produced any grounds for doing so. There are many more just like Dillar in Pierce County and the bilking of the county is running amock. Even when the Pierce County Council was alerted to it -Lindquist failed to prosecute the real culprits. In King County the main prosecution witness for the prosecutor has been Regional Services of King County Animal Control Officer Jenee Westberg. Westberg has worked for King County since 2002. Where her Kent 2006 shoplifting should have caused a "Loudermill" proceeding - there was none. It also should have put Westberg on the King County Prosecutor's "Brady Officer" list. But it didn't. In 2007, the Loudermill proceeding that began with tardiness, ended with "dishonesty and theft of county time." It led to a 4-day suspension in September of 2008. On January 24, 2008, even though Westberg's supervisor, Sgt. Steve Couvion came to pick up the inebriated and stoned Westberg (with her dog) after being arrested and booked for a rather spectacular VUCSA felony with over 9 counts of criminal law, Westberg was still not put on the King County Prosecutor's "Brady Officer" list. Neither felony arrests were mentioned in the Loudermill proceedings nor was the concurrent 2008 ATV gross misdemeanor (3rd prosecution going on at the same time) also being prosecuted by the King County Prosecutor's Office. Conversely all three criminal prosecutions were conspicuously absent from all three of Westberg's official "Loudermill" proceedings in (2008, 2013 and 2014) even though Westberg's supervisor, Sgt. Steve Couvion come to pick Westberg up from her VUCSA booking with the Black Diamond Police in 2008. The arresting officer noted Couvion had an extended conversation regarding "professional courtesy" at the time. Further requests of public documents recently reveal that there was an internal investigation regarding Westberg's 2008 VUSCA felony arrest within animal control. Couvion's statement was in direct conflict with the Black Diamond arresting officer's statements. Couvion stated, "I am not certain how it all came about of her being an ACO. Perhaps when they had probable cause they went through her belongings and find the badge then, I do not know." With the Black Diamond Police referral for probable cause to the King County Prosecutor's Office, the Black Diamond arresting officer narrative was clear about how they were first made aware of Westberg's King County Animal Control employment and her King County badge. Officer Huff: "I made contact with the female driver of the vehicle, I immediately saw a King County badge sitting on her lap. I advised the driver why I stopped her and asked for her license, registration and vehicle insurance. As I was speaking with the driver, later identified as Jenee A. Westberg (DOB: 01/30/76), I could smell an overwhelming odor of marijuana coming from inside the vehicle. Westberg advised me that she had recently purchased the vehicle and was on her way home after riding her horse. I asked Westberg who she worked for and she stated she worked for King County Animal Control. She later advised me she did not have any vehicle insurance. I returned to my vehicle and asked for Narcotics K9 handler..."
During the 4 months of Westberg's 2008 VUCSA prosecution that King County Prosecutor, Maggie Nave (WSBA# 19004) expedited, Maggie Nave was the primary prosecutor. It was heard in front of then District Court Judge Mariane Spearman (wife of Chief Justice Michael Spearman who is currently Chief Justice on the Court of Appeals Division I). Mariane Spearman is now a King County Superior Court Judge. Animal Control Officers Dave Morris and Steve Couvion visited Lindseys followed by an entourage of others including Jenny Edwards of Hope for Horses, Washington State Animal Response Team (WSART) president, Gretchen McCallum (a known ARE). The entourage of which are enriched by successful prosecutions. On the same day as Westberg's arraignment, March 19, 2008, Darryl Lindsey was extored into a plea bargain misdemeanor by King County Prosecutor E. Bradford Bales in order to exclude Darryl's wife Gina Lindsey from being prosecuted. It was agreed on March 19, 2008. On December 3, 2007, Patrick Gleason (Case# 07-347400) was targeted by King County Animal Control Officer Sgt Steve Couvion, Dave Morris, (both Westberg's supervisors), Steven Fuscher, Jenny Edwards (Hope for Horses), and veterinarian Heather Stewart. On February 5, 2008, Jake Rider (Case 08-1-00331-7) was prosecuted for animal Cruelty. Jenee Westberg was dispatched to Rider's residence on December 7, 2007 and acted as a primary witness with ACO Sgt. Dave Morris and veterinarian Heather Stewart. No one disclosed anything to Mr. Rider about Westberg's criminal career. No one disclosed Westberg's criminal history to Pappas. February 26, 2011, Christy Diemond (Case# 11-1-06177-5) was targeted by Westberg and veterinarian Hannah Evergreen aka Mueller through King County Sheriff Sgt. Bonnie Soule, Jenny Edwards of Hope for Horses, Jamie Taft and Bonnie Hammond of Save a Forgotten Equine and - the now disgraced King County Sheriff Major Crimes Detective Robin Cleary. (Cleary was terminated for criminal malfeasance through her affiliations with the now incarcerated drug dealer/pimp/embezzler Darrion Holiwell). No one mentioned Westberg's criminal history to her. In Diemond's case, her defense counsel SCRAP Dave Roberson (WSBA# 19298) and the KCDPA Maggie Nave acted in concert to conceal Westberg's criminal history as Ms. Nave denied knowing anything about being the head prosecutor in Westberg's 2008 VUCSA case in front of Judge Mariane Spearman. Judge Jim Rogers allowed it even with it became evident they had perjured themselves as officers of the court. Rogers was a long term law school classmate of Roberson. Rogers had worked with Ms. Nave for a decade and a half before taking the bench. Recently, public records revealed Ms. Nave had other problems that started over a decade before Diemond's arraignment. Larson states: "On August 17, 2011, I learned of a concern about cases in your office that had not been filed/handled. As you know, our response was to open an investigation to determine the truth of this suspicion. Mark Stockdale, from the Civil/Employment section, headed the investigation. Nothing more needs to be said about the significance of this mismanagement, in any other practice, this would be considered malpractice. It is also of significance that this failure stretched over a long period of time, dating back to 1999. In other words, this was not a singular failure or a problem that arose in one particular time frame. Rather, the failure was repeated, persistent and profound." The mismanaged files taken represent 117 case files from September of 1999 - July of 2010. Westberg's case was not among them. Nave was defrocked of her post as the Chair of the District Court Unit. Larson goes on to state: "Failure to meet these expectations in the future will lead to further discipline, up to and including termination." Nave is currently one of two early plea negotiators for Animal Cruelty, interestingly included in this assignment is "Tampering with a witness or Public Servant. None of Ms. Nave's malpractice history was ever disclosed to Diemond. Nor does it appear there was any oversight but to conceal this exculpatory evidence which was significant because of the textbook mistrial Rogers failed to rule on when Nave passionately told the jury during her close that Diemond's horses "had gained weight and were doing well now" when in fact both Diemond's horses had been euthanized under the care of veterinarian Hannah Mueller aka Evergreen and SAFE due to improper feeding and care. This happened well into the "rescue's" care -10 months and 16 months post possession. April 4, 2011 Darryl Lindsey was targeted a second time by Westberg and veterinarian Heather Stewart. The prosecution never disclosed Westberg's criminal history. Judge Mary Roberts found Westberg's collection of evidence unlawful and the case ended up dismissed. On April 7, 2011,Cherish Thomas and Jason Markley were targeted by Westberg. They claim Westberg kept them and their 4 children hostage patting the gun Westberg claimed she didn't have, for 4 hours while exhibiting drug behaviors. No one told Thomas or Markley that Westberg had a criminal record until Markley's attorney found it. April 11, 2011 Shannon Dunham was targeted by Westberg, veterinarian Heather Stewart, King County Sgt Tony McNabb and Christina Bartlett - associates of disgraced Major Crimes detective Robin Cleary who has a presence in many of these cases. Dunham was never told of Westberg's criminal history. No one disclosed Westberg's history to them. It turns out the lead prosecutor in most of these cases, King County Deputy Prosecutor Gretchen Holmgren (youngest daughter of Mike Holmgren) never disclosed any of Westberg's criminal history as required when there is "exculpatory" evidence. This is an issue coming up in the Mark Lindquist prosecutions also. In addition, Holmgren concealed a third concurrent 2008 ATV gross misdemeanor and the fact Westberg was having a second "Loudermill" hearing resulting in a 2nd suspension for dishonesty and "theft of county time" while Markley and Diemond were attempting to defend themselves. Westberg was terminated earlier this year for criminal malfeasance and has been placed on the King County Prosecutor's "Brady Officer" list. Yet the King County Prosecutor’s Office had done nothing to correct her testimony in Markley's case and 21 others just like it. They have done everything to conceal it and are currently being sued under the Public Records Act (PRA)for withholding information surrounding these cases. A second PRA was filed May 21, 2015 for further withholding of public documents. When a prosecutor withholds evidence that would service to prove of benefit to a defendant (exculpatory), it is known as a "Brady violation" says Markley who claims he has become more legally savvy than he ever imagined with no criminal record of his own until he was wrongfully accused. 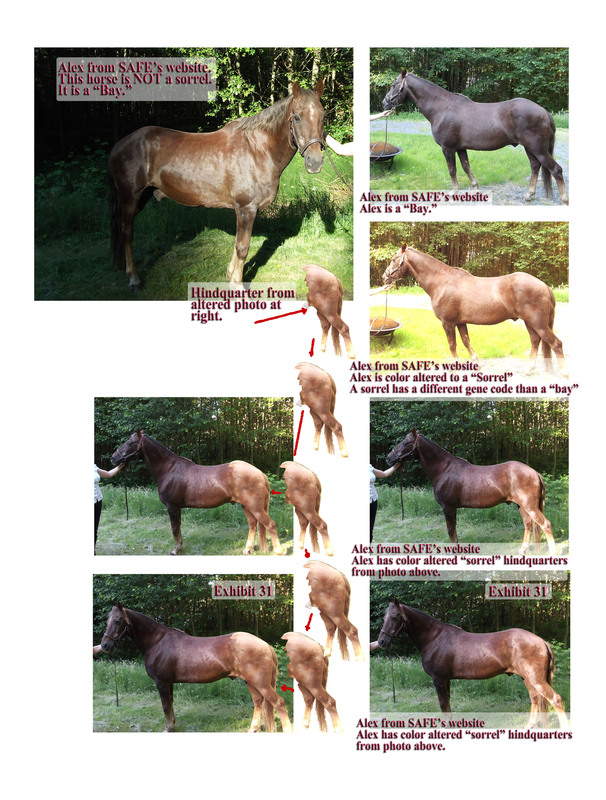 Markley says Westberg and Mueller aka Evergreen switched (see photo upper right) his horse with 1 - 3 "after" horses with the help of "rescue" organizations - that they all committed perjury during his trial then proceeded to quadruple bill the county for "Alex" under several other aliases. "She (Ms. Holmgren) can't even get the breed of the bait' n switched animals straight. Holmgren says Alex is a Quarterhorse and "Save a Forgotten Equine" (SAFE) says he's Morgan, says Markley. The horse, "Mr. Pibb" (another "after" horse) shown on TV news several times appears to be an Arabian (third horse). Markley's wife, who was a co-defendant in the same trial in the same room at the same time - only with a jury - was dismissed because the jury didn't believe the "after" horse was the same horse either. Some of the jurors risked sanctions by speaking up they were so appalled by the prosecution's claims during trial. Markley says many veterinarians and rescues are profiteering through embezzlement and fraud on taxpayers dollars while King County has failed to act. When the prosecutor creates a distressed property, they profit more by acquiring a distressed property at 30% - 70% of market value. Markley claims he has uncovered 100's of 1000's of dollars billed to the county (and paid) for manufactured care and double to quadruple billing for the same horse under several different names (through public records requests). He believes there are at least 21 cases since 2006 in King County and it appears to be epidemic nationally. To complicate matters further, the King County prosecutor in his case, Gretchen Holmgren-Peterson, who has prosecuted a majority of King County's animal abuse cases like Markley's, is the youngest daughter of one of the most elite highest-paid football coaches in the National Football League's history, millionaire (and 2015 Pro Football Hall of Fame nominee) Mike Holmgren. 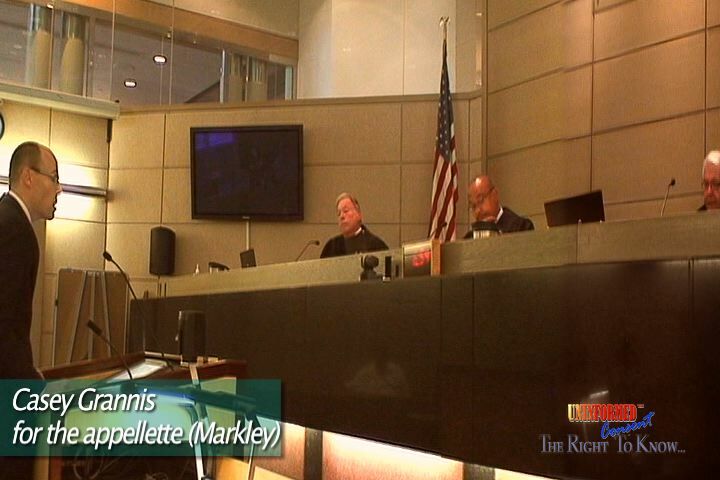 Verellen also sat on Markley's COA panel along with Chief Justice Michael Spearman (Judge Mariane Spearman's husband) and the Honorable Michael Trickey. Inthe Dunham case Holmgren attempted to collect an extra $13,000 in restitution for the care of her two mini horses and a goat, Markley's horse "Alex" and another two horses from another (third) case. Schirman acknowledged the $13,000 "miscalculation" then asked for another year's worth of restitution while there was no documentation filed with that request. The judge in that case - the honorable Mariane Spearman (wife of Chief Justice Michael Spearman) - chose to "deny the request at this time." Markley has submitted his discoveries and evidence in the form of a "Statement of Additional Grounds" (SAG) to the Court of Appeals, a "SAG addendum", SAG addendum and a point by point "SAG response" to Ms. Holmgren's argument, but so far - and during oral arguments September 12, 2014, none of the judges panel chose to visit the controversial topic in front of an audience which included not only Ms. Holmgren but her high-profile father sporting his Super bowl ring. (See the video above). Prosecutor Holmgren says Markley is guilty of animal abuse because he fed the animal "local hay" 3 -4 times a day and put shoes on the horse. While defense counsel, Casey Grannis pointed out that even if one assumed Markley was guilty, the prosecution picked the wrong law to prosecute - Ms. Holmgren claimed the local hay Markley "provided was of no nutritional value" - something local hay growers are outraged about because most of them provide forage analysis with the purchase of their hay. Ms. Holmgren then admitted that she had no evidence of that claim such as laboratory forage analysis.
" While Eastern Washington is known for producing high quality hay consistently because of the increased portion of the growing season with favorable conditions for curing hay, there is certainly plenty of high quality hay produced in Western Washington that is successfully fed to livestock, including horses. Making generalizations about hay-growing regions of the state and applying that to a given situation without forage test data, and without any other relevant supporting information, would be an error." Ms. Holmgren went on to claim that, "The only reason for a horse to be "shoed," (proper term is "shod') as presented by testimony during trial, is so that the animal can be ridden." 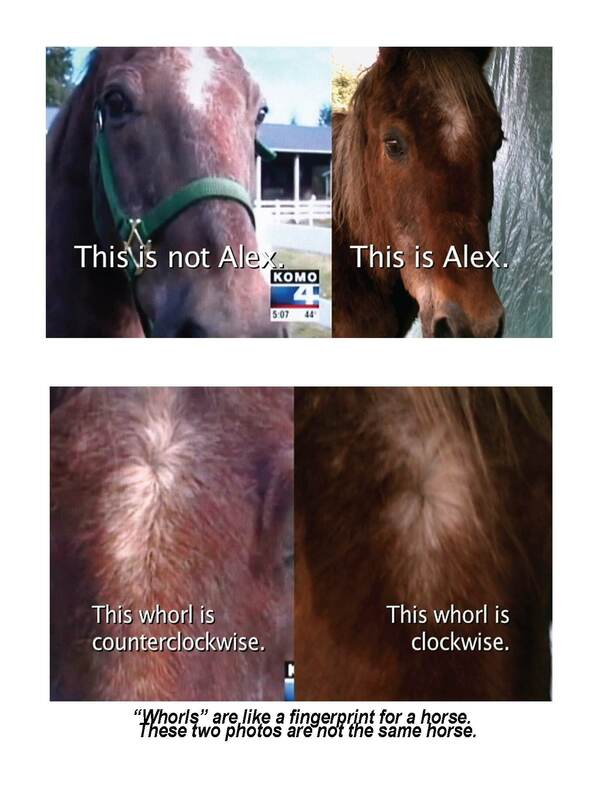 "Ms. Holmgren said this while her own expert stated during trial there are therapeutic reasons to put shoes on a horse "such as the crack developing in one of Alex's hooves." says Markley. "